This new take on futuristic racing may not replace old standards, but it's worth playing nonetheless. Delta-V Racing takes the gameplay of acclaimed futuristic 3D racers, flattens it, and literally turns it out its side. It sells itself as “Wipeout reborn” and optimized for mobile. While making this goal a reality has resulted in some unfortunate compromises, the final product’s racing reinterpretation is still pretty rad. While Sony’s techno racing franchise is the most obvious point of comparison, Delta-V Racing's other ancestors include F-Zero and even Mario Kart's power-ups. However, instead of driving through 3D courses from behind the vehicle, players steer from a side view like a side-scrolling shooter. The cars are constantly going forward so the emphasis is on vertical movement controlled by swiping up and down. Chaining boosts together creates a decent sense of speed, but without much of a horizon to look towards it’s hard to feel like one can break away from the pack by just being the fastest. Dodging obstacles and shooting rockets is fun and takes skill, but it doesn’t quite fill the speed void. However, what Delta-V Racing may lack in pure momentum it makes up for in mission variety. The four tournaments consist of nine stages like standard races, time attacks, and boss fights. 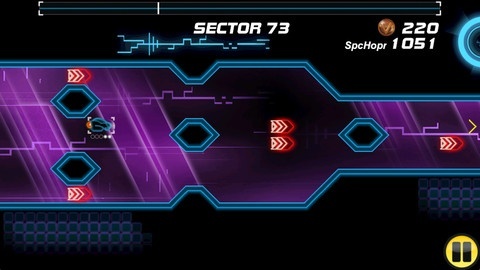 “Sectors,” one of the more creative mission types, starts players off with virtually no health and tasks them with surviving an ever-accelerating, obstacle-fraught looping track. The trick here is actually to race as slowly and carefully as possible by avoiding boost pads and hitting deceleration zones instead, a neat inversion. Depending on their performance, players earn medals and seeing all the game has to offer will take more than just each course’s single bronze medal. The difficulty ramps up well, too, so conquering each track is a considerable challenge. Delta-V Racing's gameplay feels compressed but in an expected and still enjoyable, functional way. As for the presentation, though; while down-scaling a racing experience usually presented in slick 3D would obviously lose a little along the way, the game’s style is still slightly underwhelming. The pounding club music is fine, the robotic sound effects are cute, and the hard-edged tracks are a decent Tron imitation. But the cars themselves, no matter how many are unlocked, have boring, rounded designs and flat colors. Overall the look is safe, which is the last thing a neon, futuristic racing dystopia should be. Some of what Delta-V Racing tries to fix was never really broken. Still, as a mobile game it reconfigures the rules of fast-paced, sci-fi combat racing in some very interesting, fun, and worthwhile ways.